1. Complete this form in full. 2. 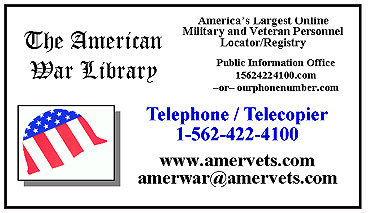 Click the button at the bottom of this completed form to email it to The War Library, or you can Print and mail this form along with a copy of the DD-214, WD AGO 53-55, NAVPERS 553, NGB or other pre-arranged documents to the Library's mailing address below. I will mail a check along with my application and documentation. The Library will receive my envelope within 10 days from today. I will mail a USPS money order along with my application and documentation. The Library will receive my envelope within 10 days from today. Would you like an archive (black&white) copy of the Certificate you are applying for to be mailed from the Records Chief directly to your Commanding Officer -or- to your Employer -or- to your School Administrator for inclusion into your permanent personnel file jacket? (Fee: $3.50) Available only when a published certificate is requested. Not available with emailed certificates. Would you like to receive the Official, full size National Defense Service medal and/or ribbon? Would you like to receive the miniature National Defense Service medal? Yes, please include the Miniature medal and add an additional $10.00 to my total. No, I already have the hardwear. Would you like a published copy of My Military Medal Last Will And Testament? Would you like to track your package using the internet through the United States Post Office after it has been shipped (for forty-five [.45] cents extra)? Personalized items shipped or emailed with a name and SN/PSN number cannot be returned or refunded. However, although typographical errors are very rare, there is no time limit on requesting corrections to errors. Print a copy for yourself before clicking the bar below.. Please lower your mouse then wait a moment for your info to be logged.